The Ibiza Music Family in one App! MACAO-CAFÉ ® was a very famous Cafe in the Harbor of Ibiza inthe1990`s. Many of the Guests where DJ`s and Artists from theClubsaround Ibiza. They came to MACAO-CAFÉ ® because of the relaxed atmosphereandthe typical mediteranian food. One of the most downloaded Ibiza apps on themarket.Find great places with our beach guide. Meet lot`s of lovelypeople and find the best restaurants and bars in Ibiza.Listen to more than 24 hours non-stop music in the typical Ibizastyle and get inspired by amazing pictures of the white island,made by professional photographers.Ibiza in your hands, download now! Discey is an international DJ andproducerlving in Ibiza, Spain.He is also the owner and founder of the record label&multimedia distribution "Ibiza-Unique".With his release "Ashram" he made his first No1 chart entry.In the app you find all news and all DJ sets from Discey. 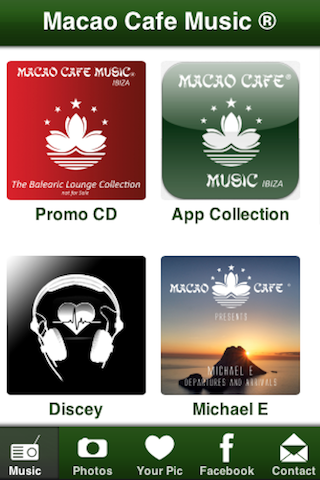 The Ibiza Music Family in one App!For all that are not yet familiar with our productions:MACAO-CAFÉ ® was a very famous Cafe in the Harbor of Ibiza inthe1990`s. Many of the Guests where DJ`s and Artists from theClubsaround Ibiza.They came to MACAO-CAFÉ ® because of the relaxed atmosphereandthe typical mediteranian food.Those where the first people to conceive the idea to makeacompilation of tracks by local DJ’s calledBALEARIC LOUNGE COLLECTIONFree for a limited Time only! Welcome to one of the best Ibiza apps on the market! Celebratingthe 5th anniversary of Ibiza-Unique we have completely redesignedthe app. Packed with lot`s of new things like our 24/7 Ibiza-UniqueRadio Channel, a mega music section containing tracks from Chilloutto Techno and a brand new Restaurant and Bar Site with Geofencingwhich means you will be noticed if something you like is near you(!) And we also rebuild the Beaches maps. Find your beloved beacheasy with the Ibiza-Unique Maps Navigation and be the first who`slaying in the sun :-) All for free, all for you. Ibiza-Unique, seeit, believe it!Welcome to one of the best Ibiza apps on themarket! Celebrating the 5th anniversary of Ibiza Unique wehave completely Call redesigned the app. Packed with lot`s of newthings like our 24/7 Ibiza Unique radio channel, a mega musicsection Containing tracks from Chillout to Techno and a brand newRestaurant and Bar Site with geofencing Which Means you will benoticed if something you like is near you (!) So And werebuild the Beaches maps. Find your beloved beach easy with theIbiza Unique Maps Navigation and be the first who`s laying in thesun :-) All for free, all for you. Ibiza Unique, see it,believe it! This is a Music Player.So,enjoy .CAFFE Apps are made by students ofCAFFE, a UK charity teaching ICT skills to underprivileged youngpeople in Dhaka, Bangladesh. Please be patient while our studentsare still learning. If you are feeling kind, please download andrate generously! Neo Soul Cafe is programmed by DJ Frances Jaye. Her passion to givethe adult listening audience a format of music from avant-gardeR&B to organic soul incorporating elements from jazz, funk, hiphop to pop, fusion, and African music. Has led her to create amultimedia movement called Neo Soul Cafe, an oasis for soul musicconnoisseurs. "The Music That Gets Your Head Right". A simple music player by Sufia.This app will play mp3 files in the'music' folder of your SmartPhone or Tablet.CAFFE Apps are made bystudents of CAFFE, a UK charity teaching ICT skills tounderprivileged young people in Dhaka, Bangladesh. Please bepatient while our students are still learning. If you are feelingkind, please download and rate generously!